More on what to expect in 5.1 after the break. The best of 5.1 sees the Horde-Alliance conflict escalate in the form of new dailies. Horde and Alliance faction strongholds in the Vale of Eternal Blossoms will become capture points, and each side will fight in the Krasarang Wilds between to capture strategic objectives and give enemies a good seeing to. All in the name of Commissions, to be spent in the strongholds on NPC guards and more. Beyond that there’s the new Brawler’s Guild, which will see Stormwind and Orgrimmar play host to underground PvE fighting rings for ranked solo battles against “some of the toughest creatures found in World of Warcraft”. 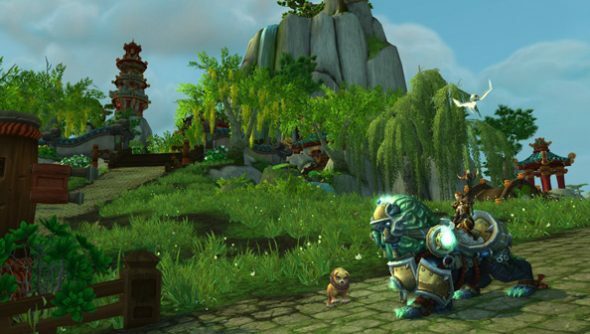 Here are the World of Warcraft 5.1 patch notes for your delectation, which feature pet battle updates. Spotted anything else exciting?